Standard wooden tees are the most common type of golf tee. Given the technological advances in golf clubs and balls during the past decade, it's only fitting that the sport's tees have changed, too. 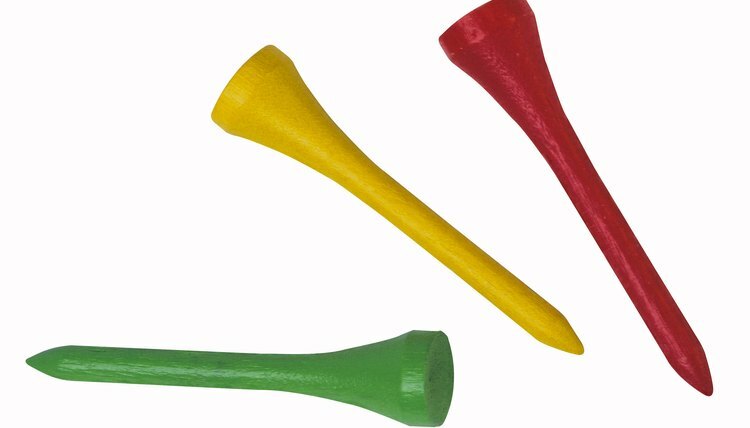 Although the majority of golfers tee up their balls with standard wooden golf tees, this style of tee is not your only option. Numerous types of tees are available on the market. Wooden tees are standard in most golfers' bags. They usually range in size from 2 1/4 inches up to 4 inches, although 2 3/4 is one of most common sizes. The tee features a narrow shaft and a circular cup on the top to support the ball. Wooden tees are common in white, but it's possible to obtain them in plain wood finishes and virtually every color. If you use a driver with a large clubface, you might favor an extra-long wooden tee. If you cannot get rid of your slice through lessons and using different clubs, an anti-slice tee might do the trick. These tees are plastic and feature a cup on their back side that supports the ball. The logic behind this design is when your clubface comes into contact with the tee, it propels the ball without the ball inheriting a side spin from your club angle. Friction-free tees are made of plastic and have shafts that closely resemble a standard wooden tee. The friction-free tees, though, have three to six points instead of the circular cup to hold the ball. These points reduce the amount of friction on the ball while it sits on the tee. The manufacturers claim this design provides your ball with a higher launch angle. Using similar logic to the friction-free tee, the brush tee is a plastic tee that uses a soft brush bristles to support the ball. Less friction and resistance at the point of impact should result in longer shots off the tee, according to the manufacturers. These tees are available in a variety of heights.